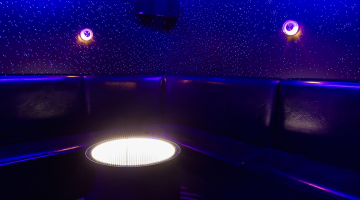 PLEASE NOTE - Because of alcohol service and the private nature of our karaoke rooms, all persons in your party must be 21 years of age or older. 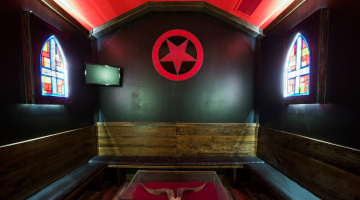 The Highball features seven karaoke rooms conceived by Zack Carlson and Laura Fleischauer from Space Warp Design with themes ranging from 8-bit wonderland to heavy metal church to, well, the Black Lodge from Twin Peaks. 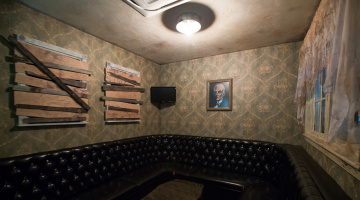 Each room features a comprehensive and freshly updated selection of songs from all genres, a magic voice synthesizer to make your tone-deaf friends sound like a badass, and well as a dedicated server who can supply you with all the liquid courage (and snacks) needed. If you want to prepare for your performance, download our karaoke app for your iPhone or Android so you can access our entire song list. 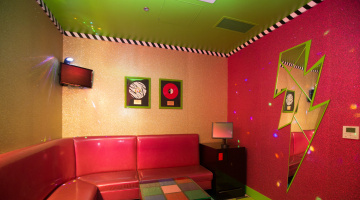 Karaoke rooms are available for both walk-ups and by reservation. Private rooms are strictly 21 and up. 22 people max. Metal gods and major ragers can unleash the beast within The Inferno. 8 people max. The center of the darkest woods leads into the Red Room, a surreal and mysterious limbo where you can always find a damn fine cup of coffee. Let's rock. 18 people max. 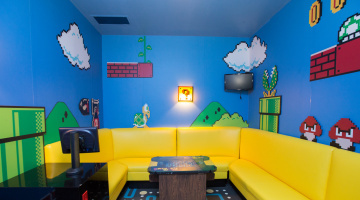 Dust off your Powerglove; it’s time to battle marauding gangs of ghosts and goombas in our no-rules 8-bit battlefield! 14 people max. Beyond the human mind lays a universe of bold impossibilities. Time, form and substance... sound and shadow... all will be revealed in the swirling vortex of The Fifth Dimension. 14 people max. Harness the power of glitter and glamour to transform into the ultimate neon-charged new wave superstar! 18 people max. Your blood runs cold as you take shelter in this decaying house; forgotten by all… except the inhabitants of the cemetery next door. 18 people max. 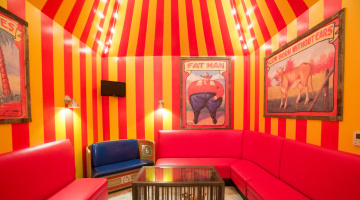 Step right up into our gallery of the odd, the unusual, the unexplainable and the unimaginable! Stay long enough and you'll become one of us. Gooble gobble! NOTE: Our only room that is wheelchair accessible.